Daily Illuminator: You Can Go Back To Constantinople! August 13, 2012: You Can Go Back To Constantinople! One of the greatest cities of all time is waiting for you. 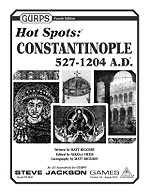 Book passage now, with GURPS Hot Spots: Constantinople, 527-1204 A.D. This supplement provides complete gamer-geared information on this magnificent metropolis, including GURPS City Stats details on three iconic eras. Written by Matt Riggsby -- coauthor of GURPS Low-Tech and virtuoso behind GURPS Hot Spots: Renaissance Florence -- it offers the history, geography (including map), religious views, and military details of this realm. It also provides travel details that make the city come alive; learn about the Constantinople outlook on life, the food and attire, the customs, and much more. For those of a more mercantile mind, you'll find information on local economics and commerce. You'll also navigate the tricky hierarchy of titles and protocols with extensive details to who's called what, as well as the import of status and rank. Finally, it delivers a trove of advice for using Constantinople in a campaign, or adapting it to other settings and eras. Over 600 years of history await in a megapolis that is both timeless and yet all too mortal, with GURPS Hot Spots: Constantinople, 527-1204 A.D. Discover its iconic appeal! 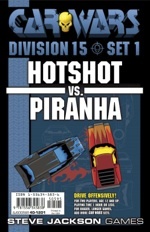 Alternatively, for those who prefer their adventure to involve more futuristic firefighting, might we suggest the first of the classic Division 15 quick-play kits -- Car Wars Division 15 Set 1 - Hotshot vs. Piranha -- newly released to e23? The versatile Hotshot can deliver death in all directions, while the Piranha can "bite" its victims with three machine guns and a rocket launcher. Get the rules, counters, and vehicles you need for high-powered one-on-one Car Wars action!